Ex Dr V.J.A.Flynn Collection and previously from A.H.Baldwin & Sons, London. Kalat is a state located in Baluchistan. This the Khanate of Kalat had once been a feudatory of Kabul but became independent after Panipat. In 1839 Kalat was taken by the British and in 1854 a formal treaty was executed. 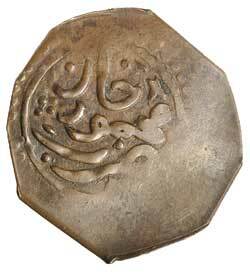 From that time Kalat issued these crude octagonal copper falus for local use. 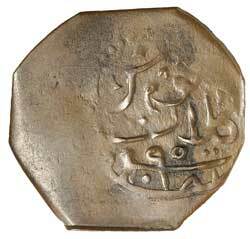 The mint was closed in 1893 when Khudadad Khan was deposed for misrule.